Aim To investigate risk factors for retinal detachment (RD) after cataract surgery, particularly posterior capsular rupture (PCR) with or without vitreous loss. Methods Single centre electronic medical record database study of 18 065 consecutive first eye cataract operations performed between 2005 and 2014. Survival analysis was performed with Kaplan–Meier curves and a Cox proportional hazard regression analysis to calculate HRs with respect to RD. Results The RD rate at 3 months and 7 years was 0.067% and 0.30%, respectively, with a median time to RD of 15 months (mean: 18 months, range: 0–84 months). Men had a higher RD risk (HR 2.00; 95% CI 1.03 to 3.88; p=0.03) in the univariate model. Patients <60 years and those >80 years had an HR of 5.12 (95% CI 2.60 to 10.07; p<0.001) and 0.16 (95% CI 0.38 to 0.69; p=0.01), respectively, compared with patients 60–80 years of age. Eyes longer than 25 mm had an HR of 3.98 (95% CI 1.93 to 8.20; p<0.001) compared with eyes 23–25 mm. PCR occurred in 400 (2.2%) eyes. The HR for RD was 12.83 (95% CI 5.62 to 29.30; p<0.001) for PCR with vitreous loss. There were no RD events in eyes with PCR without vitreous loss. Conclusions The risk for RD after cataract surgery is higher in younger patients and eyes with longer axial length or PCR with vitreous loss during surgery. Few studies have analysed data from routine clinical practice and almost all previous studies included both eyes of patients in their analyses potentially biasing their results. The Royal College of Ophthalmologists in the UK has supported the development and implementation of detailed nationally agreed datasets within electronic medical record (EMR) systems including: the cataract national dataset (CND) and RD dataset to facilitate local and national audit.10–14 EMR systems that have implemented the CND mandate the recording of the presence or absence of specified complications during cataract surgery, facilitating detailed analysis of the relationship between specific operative complications and subsequent RD. 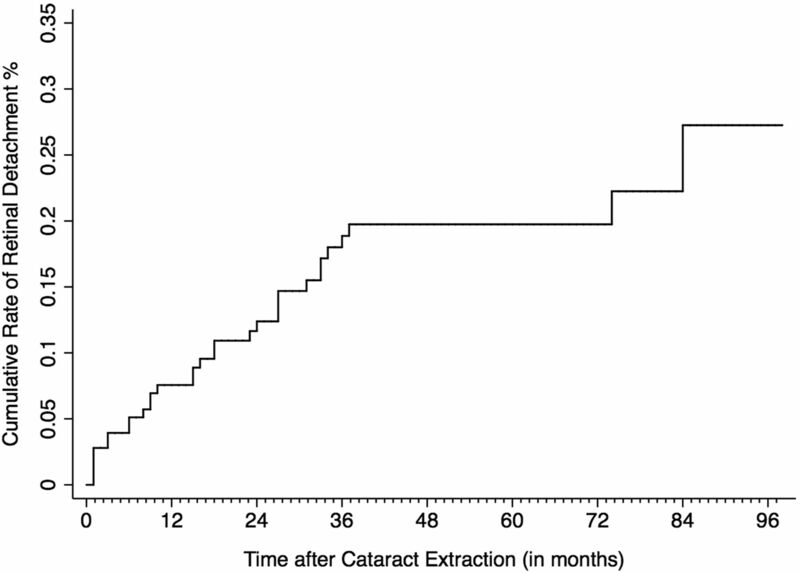 The purpose of this study was to estimate the contemporary incidence of RD after cataract surgery and to identify and quantify associated risk factors. Gloucestershire Hospitals National Health Service (NHS) Foundation Trust is the sole NHS provider of cataract surgery and is the only facility for retinal surgery (NHS or private) for a geographically discrete population, where few if any patients travel to seek surgery at neighbouring units but in order to maximise identification of subsequent RD cases the closest neighbouring units, Bristol Eye Hospital (40 miles (65 Km) away), Oxford Radcliffe Hospitals Foundation Trust (40 miles (65 Km)) and Sandwell and West Birmingham Hospitals NHS Trust (50 miles (80 Km)), which all use the same EMR were contacted and their databases searched for patients with a Gloucestershire postcode. For Birmingham Hospitals data were only available from 2008 onwards while search was extended to a second EMR also in use. This study analysed all phacoemulsification operations performed from November 2005 to January 2014. It was conducted in accordance with the Declaration of Helsinki, and the UKs Data Protection Act and was approved as an audit by the audit committee of the trust, therefore no institutional review board/ethics committee approval was required. Combined procedures, vitrectomised eyes and eyes with a history of trauma were excluded from the sample. All data were extracted from the EMR system using automated audit tools within the EMR. All eyes where an ‘anterior vitrectomy’ procedure was recorded as part of the cataract operation or where an operative complication that implied PCR with vitreous loss were classified as ‘PCR—vitreous loss’, regardless of whether this specific complication was ticked (as surgeons may have only record the more serious complication, for example: ‘nuclear/epinuclear fragment into vitreous’). In order to avoid bias due to associations between eyes, only first operated eyes having cataract surgery were included in the statistical analysis. The data extraction included: gender, age, axial length, operative complications (in particular PCR and whether this occurred with or without vitreous loss) and time interval to RD. Continuous variables were stratified and transformed into categorical variables to facilitate statistical analysis. Age and axial length were both stratified into three comparably sized groups: <60 years, 60–80 years, >80 years and <23 mm, 23–25 mm and >25 mm, respectively. The age groups were chosen based on the fact that the appearance of posterior vitreous detachment (PVD) rises dramatically after the age of 60 years and in order to facilitate comparison with related previous studies.2 ,7 ,15 The calculation of the follow-up time was based on the assumption that all patients without an RD event and all patients where death was not recorded in the EMR were still under potential follow-up. After presenting the descriptive statistics for the population studied, a survival analysis was performed with Kaplan–Meier curves used to present the results, with RD as the dependent variable. A Cox proportional hazard regression analysis, both univariate and multivariate, was used to calculate HRs with a CI of 95% for the studied risk factors. In the multivariate model, all factors were included initially and the variable with the higher p value was sequentially removed (back stepwise) until only variables with p values <0.05 remained in the model. The statistical analysis was performed using SPSS V.22.0 (IBM SPSS Statistics), and figures were created using STATA V.13.0 (Stata, Texas, USA). Between November 2005 and January 2014, 29 429 phacoemulsification cataract operations were performed where the primary indication was cataract surgery only but 11 364 ‘second’ operated eyes were excluded, leaving 18 065 first eye cataract surgery operations in 18 065 patients available for analysis. The median age was 77 years with an IQR of 12 years. The median axial length was 23.3 mm with an IQR of 1.40 mm (table 1). By 3 months and by 7 years, 12 and 36 analysed eyes had developed an RD, a cumulative RD rate of 0.067% and 0.30%, respectively (figure 1). Of the 36 eyes with RD, 4 (11.1%) were identified at the Bristol Eye Hospital, outside Gloucestershire. The search of the EMRs in Oxford and Birmingham yielded no additional cases. The median time to RD was 15 months (mean: 18 months, range: 0–84 months). Eighty-two (0.45%) patients were registered as deceased during the postoperative period on the EMR. Cohort of 18 065 eyes showing the cumulative retinal detachment rate (most retinal detachment events occur in the first 3 years). The risk of RD among men was twice that of women (HR 2.00; 95% CI 1.03 to 3.88; p=0.03) but this difference was only statistically significant in the univariate model (figure 2A). Younger age conferred a higher risk of RD, with patients <60 years having a fivefold increased risk (HR 5.12; 95% CI 2.60 to 10.07; p<0.001) compared with the reference age group of 60–80 years and patients >80 years having an 84% reduced risk (HR 0.16; 95% CI 0.38 to 0.69; p=0.01) (figure 2B). This was true in both univariate and multivariate analyses (table 2). Cohort of 18 065 eyes showing comparison of the cumulative retinal detachment rate: (A) by gender, (B) age, (C) axial length and (D) PCR. PCR, posterior capsular rupture. Short eyes (<23 mm) did not have a statistically significantly different rate of RD compared with eyes of normal axial length (23–25 mm). Long eyes (>25 mm) had an almost fourfold higher risk in the univariate analysis (HR 3.98; 95% CI 1.93 to 8.20; p<0.001), reduced to 2.7-fold in the multivariate analysis (HR 2.74; 95% CI 1.31 to 5.71; p<0.001). Both results were statistically significant (figure 2C). HRs are shown in table 2. PCR occurred in 400 (2.2%) eyes of the 18 065; 328 (1.8%) with vitreous loss and 72 (0.4%) without vitreous loss. Subsequent RD developed in: 29 (0.16%) of the 17 665 eyes with an intact posterior capsule, 7 (2.13%) of the 328 eyes with PCR with vitreous loss and 0 of the 72 eyes with PCR without vitreous loss, during cataract surgery (table 2). PCR with vitreous loss, therefore, carried a 13–16-fold increased risk for RD (univariate model: HR 12.83; 95% CI 5.62 to 29.30; p<0.001, multivariate model: HR 15.94; 95% CI 6.96 to 36.45; p<0.001). No eyes with PCR without vitreous loss developed an RD and hence statistical analysis was not applicable (figure 2D). This study looked at the incidence of RD after cataract surgery and associated risk factors in first operated eyes of 18 065 patients in a geographically localised region in the UK. We found a cumulative rate of RD of 0.30% in 7 years and observed a fivefold increased risk in patients <60 years and almost a fourfold rise in eyes >25 mm in length. 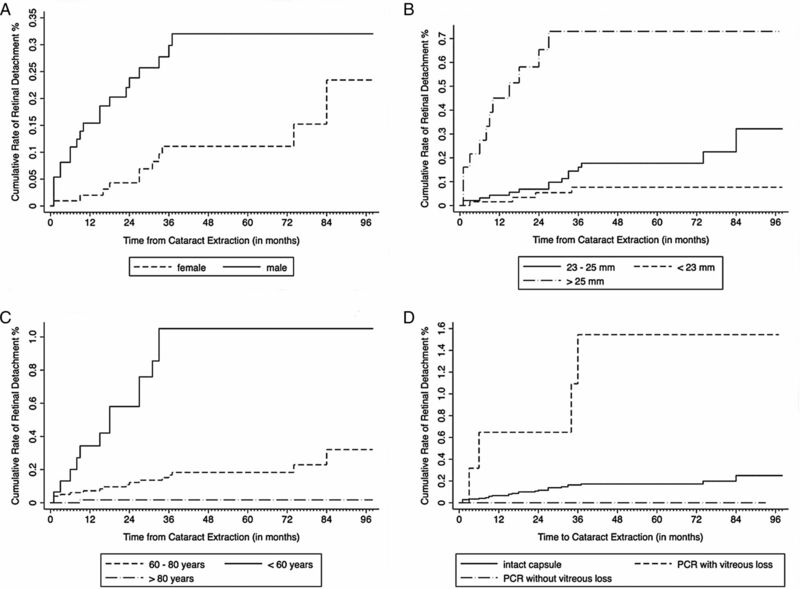 PCR with vitreous loss was associated with a >13-fold increase in RD after cataract surgery. The unique benefit of the methodology employed in this study is the 100% data capture of age, gender, axial length and the presence or absence of specified operative complications during cataract surgery, which should provide a reliable estimate of the relative risk of these factors on the development of subsequent RD. As identified in previous studies, we found that male gender, younger age, longer axial length and intraoperative complications (PCR) during cataract surgery are all risk factors for the development of RD after cataract surgery. Male gender is a well established risk factor considered to increase the RD rate by 2.5-fold.2 ,3 In our study, the respective HR was 2.0 (95% CI 1.03 to 3.88) and was significant in the univariate model (p=0.04) but not in the multivariate model (p=0.43). This is probably because in our sample men were on average younger and had longer eyes than women (table 1). It is postulated that men were, therefore, less likely to have benefited from the protective effect of an age-related PVD while at the same time the longer axial length increased the risk for RD. It seems likely that for patients of the same age and with eyes of similar axial lengths, gender alone would not influence the risk of RD after cataract surgery. The estimate of the absolute cumulative rate of RD in this study (0.3% by 7 years) may be an underestimate of the true rate and is towards the lower end of that reported in the literature (0.16%–2.31% at 7–10 years).1–5 This may be contributed to by lack of reliable capture of date of death data within the EMR as it is not automatically retrieved from the hospital administration system unless a record number is typed into the EMR and hence is not reliably recorded within the dataset we are able to extract. We report a 0.45% death rate in 7 years compared with 5.1%–21.4% for patients >45–55 years in other studies.22 ,23 In addition, patients may have presented with RD to other units, but this factor was mitigated by searching the database of our closest neighbouring units. The rate of RD in our study may also reflect a truly reduced incidence of RD in the phacoemulsification compared with extracapsular cataract extraction (ECCE) era. Clark et al2 in a study of 65 055 eyes operated between 1989 and 2001 reported a 10-year RD rate of 0.68%, but when comparing consecutive time periods he found a significant drop in RD rates from 0.96% between 1989 and 1993 to 0.25% for those operated between 1999 and 2001. Lin et al5 reported a 7-year cumulative RD rate of 0.84% in 9184 eyes having cataract surgery from 2000 to 2010, but this study included ECCE and the female:male ratio was 1:2. Since ECCE and male gender are suspected to carry an increased risk for pseudophakic RD it is, therefore, not surprising that the rate they documented was higher than in our study.2 ,4 ,6 By comparison the age-standardised incidence of RD in the community is around 11.2–17.9 cases per 100 000 people per annum, making pseudophakic RD five times more likely than RD in the general population.24 ,25 Even if our absolute cumulative rate of RD is a slight underestimate of the true rate we believe there is no reason that the relative rates in different PCR groups should be biased by any of these limitations. In conclusion, according to our results younger age, longer axial length and PCR with vitreous loss increase this risk for RD after cataract surgery. The data in this study though suggests that PCR without vitreous loss may not increase the risk of RD but a larger sample is needed to confirm or refute this observation.
. Risk for retinal detachment after phacoemulsification: a whole-population study of cataract surgery outcomes. American Medical Association, 2012. Royal College of Ophthalmologist. The Cataract National Data Set (CND). 2010. http://www.rcophth.ac.uk/core/core_picker/download.asp?id=854&filetitle=Cataract+National+Data+set+submission (accessed 4 Feb 2015). Royal College of Ophthalmologists. The Retinal Detachment Data Set. 2011. http://www.rcophth.ac.uk/core/core_picker/download.asp?id=1217&filetitle=Retinal+Detachment+Data+Set (accessed 4 Feb2015). Contributors All authors had a substantial contribution to the conception, the design of the work, the acquisition and the analysis or interpretation of data. They all helped with drafting the work or revising it critically for important intellectual content. They all approved the final version sent to the journal for publishing and they agree to be accountable for all aspects of the work in ensuring that questions related to the accuracy or integrity of any part of the work are appropriately investigated and resolved. Competing interests RLJ is a director and shareholder in Medisoft the electronic medical record (EMR) supplier that has its EMR installed at the hospitals from which data were extracted. Ethics approval This is a retrospective data analysis study and was approved by clinical audit review board of the Gloucestershire Hospitals NHS Foundation Trust.